A gentle, sulphate-free body wash that cleanses and refreshes the skin. Suitable for daily use, it contains powerful antioxidants that replenish and rehydrate the skin, keeping is soft and subtle to prolong the life of your tan. A velvety lightweight tanning foam produces an instant golden tan that deepens into a rich bronze glow within two hours after application, creating a completely natural looking, streak-free tan. 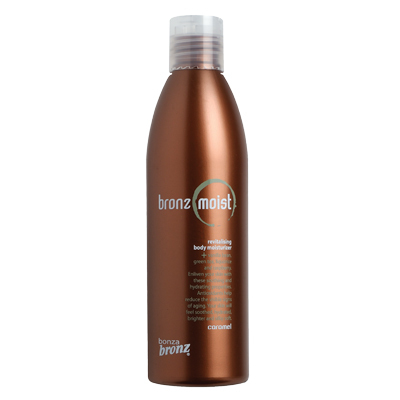 A fabulous lightweight mousse that creates an instant, natural looking tan that easily rinses off after your first wash. Quick and simple to apply, the instant bronzing glow mousse is fantastic for anyone on the run who wants an immediate, radiant glow! Infused with vanilla bean, green tea, liquorice and raspberry, this environmentally friendly and sulphate-free body wash gently cleanses as it soothes and hydrates skin. Invigorate dull skin with this gentle water soluble exfoliant, enriched with botanical extracts and free from residues, perfect for use prior to application of fake tan. An over all body moisturizer that soothes skin as it nourishes. Contains an elixir of vanilla bean, green tea, licorice and raspberry, which absorbs quickly leaving the skin energised. This 3 piece home tanning kit will ensure a perfect tan all year round! Comprising of Bronz Polish, Bronz Moist & Bronz Saver these incredible products will cleanes, hydrate and nourish the skin whilst helping extend the life of your tan. Available in Caramel, Crush and Vanilla. A gentle body tonic that cleanses the skin whilst added collagen condition, tone and nourish. The water-based formula allows the skin to soak up a sunless tan, leaving it feeling fresh and clean. Use daily to maintain a sunless tan. A lightly foaming body scrub that will smooth, polish and energise the skin. 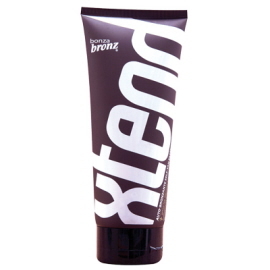 This gentle water-based cleanser allows the Bonza Bronz sunless tan to evenly penetrate the skin, helping set and prolong the tan. Use before using sunless tan gels, lotions or sprays. Streak Free Tanning Mitt has a velvety surface that ensures an even coverage of the tan while the membrane barrier stops the tanning from entering the inside of the mitt.